Your wedding day is one of the most important days of your life. It is a special day shared with the people that mean the most to you in the world. Your bridesmaids are your closest friends. Of all the people you know, you have chosen these ladies to have a special spot in the ceremony. These friends have thrown you a bridal shower, maybe even a bachelorette party, and they've maybe squealed with delight in some parts throughout the entire planning process. These are girls you have probably known most of your life or maybe they are new friends you have only known for a short time, but either way, they have grown to become very important to you. That is why you chose them to share in your special day. How can you thank them for their friendship, love and support? 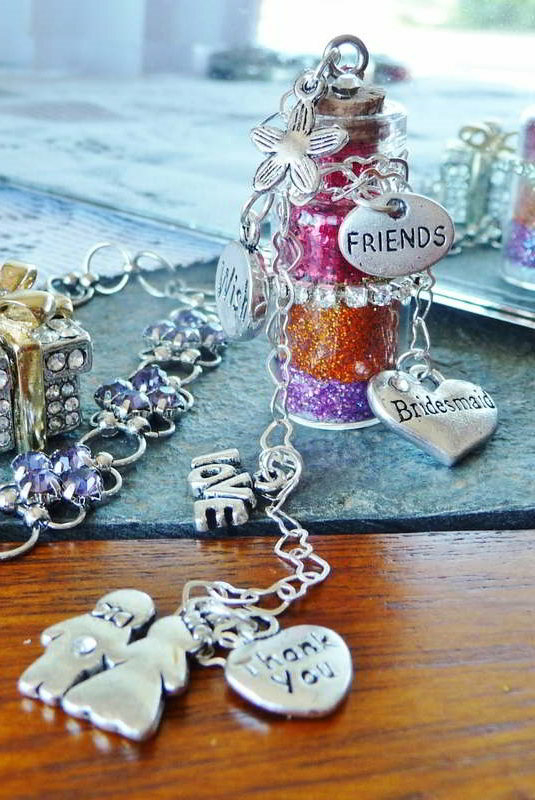 It is a common tradition to give your bridesmaids gifts to show your appreciation. Typically, these gifts are small tokens...but do they really express how you truly feel? Putting your feelings into a gift is nearly impossible to begin with, but choosing such an important gift as a bridesmaid thank you gift is even more difficult. The gift should not only say how much you appreciate their friendship but also how you wish they too will experience the same love and joy you are feeling in your own life. You want to give them a gift that they can keep to remind them of how much you care, and how grateful you are that they are a part of your life. There is only one gift as special and unique as the friends you chose to stand up with you at your wedding. Only one gift that can help you express how you feel. A gift that can give your friends a lifetime of hope, love and wishes. And that is a Captured Wishes bridesmaid thank-you gift. 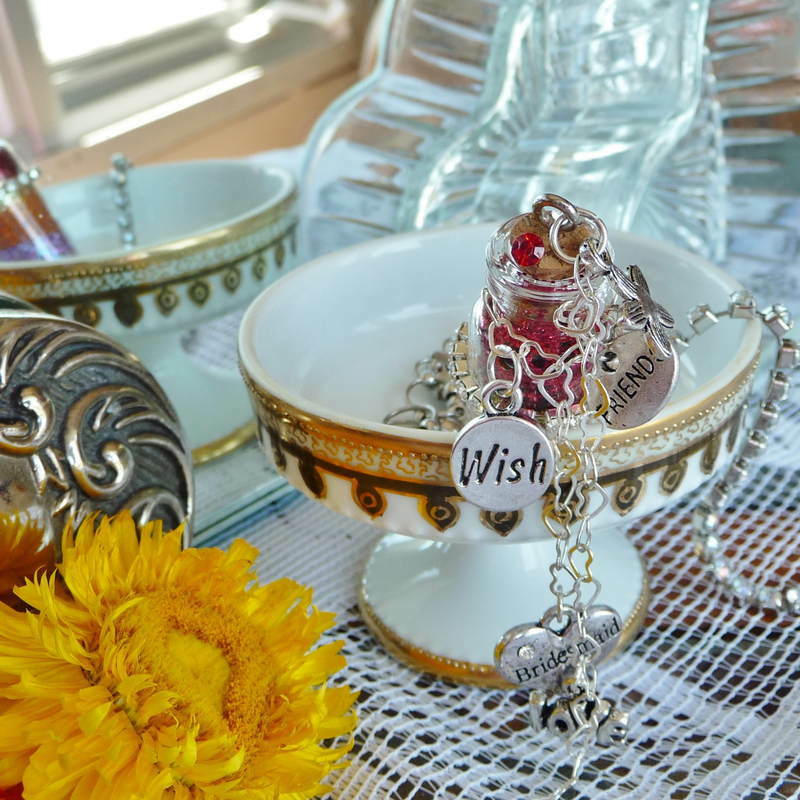 Each unique Captured Wishes bridesmaid thank you gift is a vessel filled with love and joy in the form of fairy dust within; different colors of the fairy dust symbolically represent the different feelings you want to express. The gift also comes with a special verse card designed especially for this occasion which tells the story of the layered wishes. No matter what happens, your special bridesmaids will always have this unique gift to remind them of you and the precious time you spent together. Wishes can be made or thoughts will arise; there is so much love and memories to remember! The happy memories of the wedding will come flooding back. What better way to be reminded! This is sure to put a smile on each bridesmaid's face and a song in their heart. No matter what life has thrown your way, or theirs, this bottle of happiness and good wishes is guaranteed to let the bright sun shine through. Every person that receives a unique Captured Wishes gift is amazed at how such a small gift can bring such huge happiness. It's not the size or cost of a bridesmaid thank you gift that counts. What matters the most is how your bridesmaids feel every time they hold this unique, chic little gift in their hands. This gift will most assuredly remind them of the love and friendship they share with you, and how you shared one of the most important days of your life with them.